Sequels are trendy…and our first-ever Oktoberfest in 2016 was such a blast, we’re bringing it back for Jahr zwei! We’re excited to welcome back our Freund and noted NYC spirits expert Patrick Watson of Stinky BKLYN and Smith and Vine, who will present a flight of beers curated to match the evening’s festive music, and our friend Laura Green as our dirndl-clad Emcee to lead us in singing and toasting! Also among our evening’s musical artists are the wonderful and talented Tim Krol and our very own Marguerite Easterbrook. And of course as your hosts the WVC will also lead the Brauhaus in some festive favorites! A portion of your $60 ticket price is tax–deductible as a contribution to the West Village Chorale, a 501(c)(3) organization. 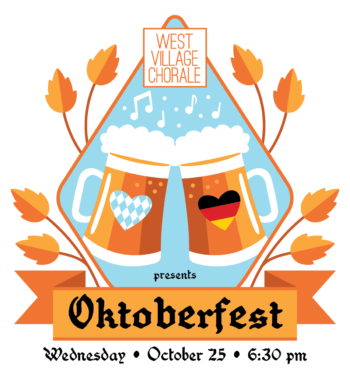 Come enjoy some brews, brats and festive singing while supporting the Chorale! We hope to raise a pint with you on October 25th. Prost!